Somehow, nearly 15 years have passed since September 11, that deadly terror attack that forever changed the United States of America. As that morning unfolded, you knew you’d never forget where you were or what you were doing when you heard the news a plane had struck the World Trade Center. And when it was clear that terrorists were to blame, and that they’d killed thousands of people, you knew the world would never be the same. I think about that day a lot. I was in college, and recall watching a fighter jet race across the blue sky. Maybe it was in the air as a result of the attacks. Maybe not. But at the time I couldn’t help but wonder if jets and terrorism and the feeling of vulnerability were the new normal. For a lot of people around my age, it marked the first time we felt like the innocence was lost. They were dark days, for sure, but over days and weeks and months the dark cloud lightened and there was patriotism and American pride like I’d never seen to that point in my 22 years. Maybe time has colored my memory. Perhaps the divisions that seem so sadly evident today were just as evident in the days following the attack. But I don’t think so. We were all just humans, living on common soil, aghast by what had taken place but inspired by so many stories of brave people who ran toward the tragedy, into hell on Earth, to help people they didn’t even know. Some of them made it back out. A lot of them didn’t, their life cut short by a sense of duty to help their fellow human. 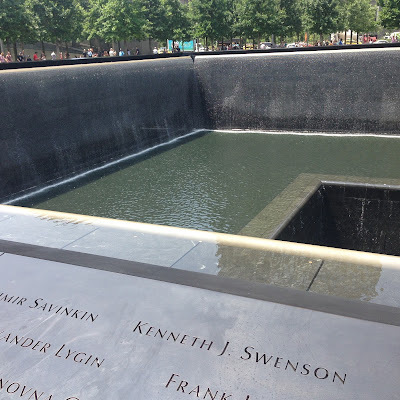 The names of all the people who died during the 1993 and 2001 terrorist attacks on the World Trade Center are etched in bronze panels that that ring two massive reflection pools. 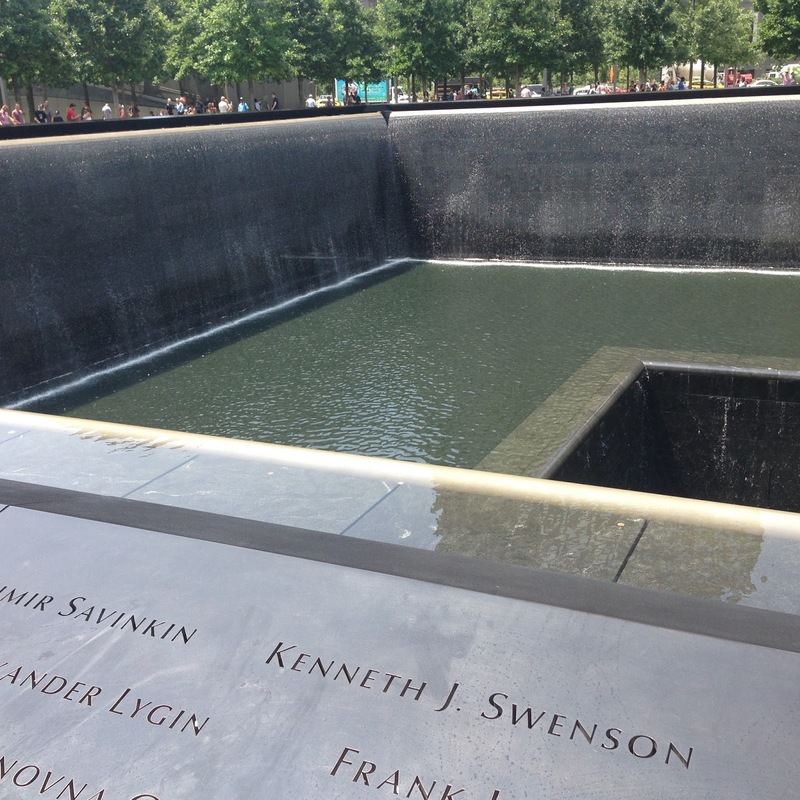 These pools, each an acre in size, are within the footprints of where the Twin Towers stood, high and proud until that September day. I visited those pools last week and looked at the names inscribed in bronze. Sons and daughters, fathers and mothers, brothers and sisters. All of their pictures hung inside the museum. Faces to go with the names. Perhaps other people inside the museum with me knew some of those who died. Perhaps not. Either way, we all were bound by the tragedy of lives taken unfairly and before their time. Despite the pervasive sadness of that museum room, it was somehow reassuring to watch people from all walks of life react on a human level to pictures of those whose lives were lost. 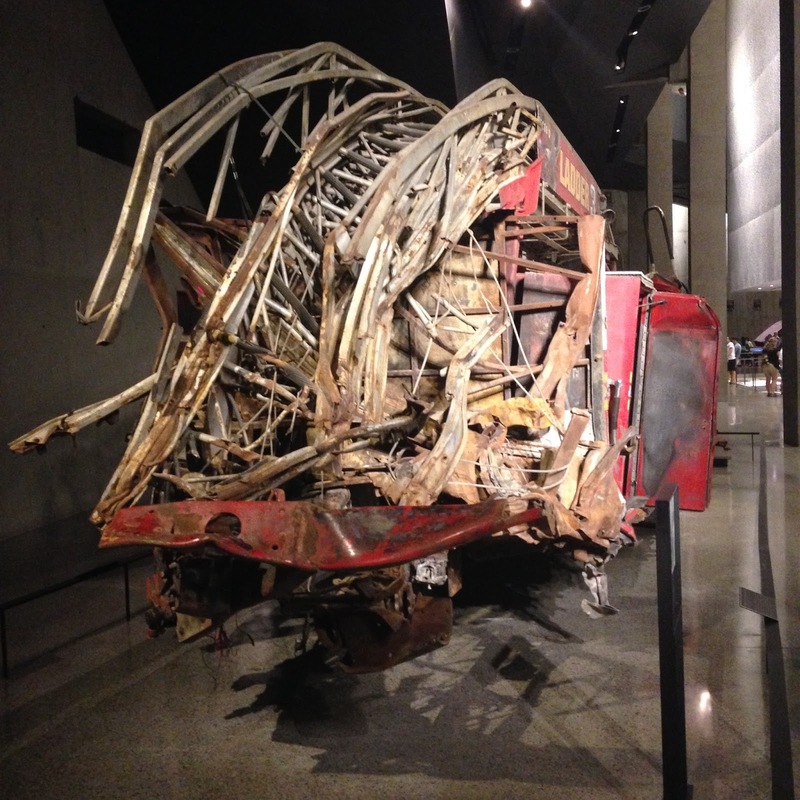 In another part of the museum was a mangled fire truck. A plaque explained that all 11 firefighters who used the truck died that day. Most of them had just finished a long shift and were headed home when the first plane struck. 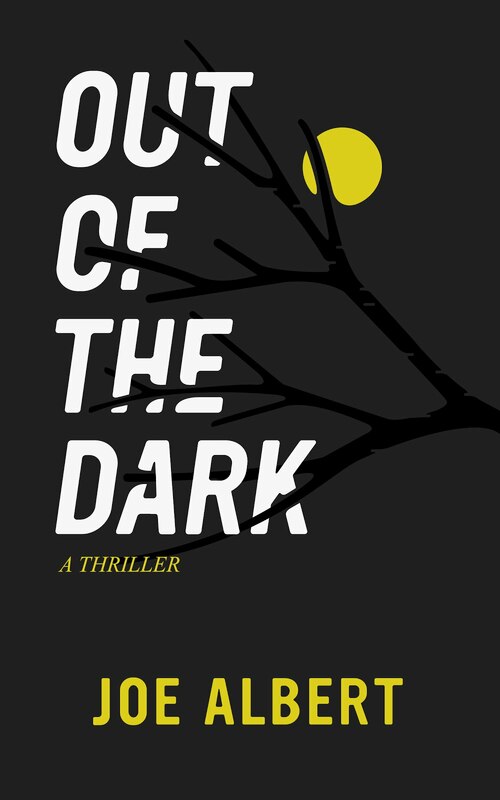 They turned around, pulled on their boots and jackets, and ran into a building from which others were trying desperately to escape. We so often talk about the thousands of lives lost that day, an older gentleman standing near the fire truck was saying, but we rarely think about the fact that five times more people survived because firefighters and other rescue personnel cared more about their fellow man than themselves. Emotions run deep in a place like this, yet in a world that seems so divided, it’s a stark and refreshing reminder that the things we have in common are far greater than the things that drive us apart.